The problem of magnetohydrodynamic flow and heat transfer of a viscous, incompressible, and electrically conducting fluid past a semi-infinite unsteady stretching sheet is analyzed numerically. The problem was studied under the effects of Hall currents, variable viscosity, and variable thermal diffusivity. Using a similarity transformation, the governing fundamental equations are approximated by a system of nonlinear ordinary differential equations. The resultant system of ordinary differential equations is then solved numerically by the successive linearization method together with the Chebyshev pseudospectral method. Details of the velocity and temperature fields as well as the local skin friction and the local Nusselt number for various values of the parameters of the problem are presented. It is noted that the axial velocity decreases with increasing the values of the unsteadiness parameter, variable viscosity parameter, or the Hartmann number, while the transverse velocity increases as the Hartmann number increases. Due to increases in thermal diffusivity parameter, temperature is found to increase. Fluid and heat flow induced by continuous stretching heated surfaces is often encountered in many industrial disciplines. Applications include extrusion process, wire and fiber coating, polymer processing, foodstuff processing, design of various heat exchangers, and chemical processing equipment, among other applications. Stretching will bring in a unidirectional orientation to the extrudate, consequently the quality of the final product considerably depends on the flow and heat transfer mechanism. To that end, the analysis of momentum and thermal transports within the fluid on a continuously stretching surface is important for gaining some fundamental understanding of such processes. Since the pioneering study by Crane  who presented an exact analytical solution for the steady two-dimensional flow due to a stretching surface in a quiescent fluid, many studies on stretched surfaces have been done. Dutta et al. and Grubka and Bobba  studied the temperature field in the flow over a stretching surface subject to a uniform heat flux. Elbashbeshy  considered the case of a stretching surface with variable surface heat flux. Chen and Char  presented an exact solution of heat transfer for a stretching surface with variable heat flux. P. S. Gupta and A. S. Gupta  examined the heat and mass transfer for the boundary layer flow over a stretching sheet subject to suction and blowing. Elbashbeshy and Bazid  studied heat and mass transfer over an unsteady stretching surface with internal heat generation. Abd El-Aziz  analyzed the effect of radiation on heat and fluid flow over an unsteady stretching surface. Mukhopadyay  performed an analysis to investigate the effects of thermal radiation on unsteady boundary layer mixed convection heat transfer problem from a vertical porous stretching surface embedded in porous medium. Recently, Shateyi and Motsa  numerically investigated unsteady heat, mass, and fluid transfer over a horizontal stretching sheet. In all the above-mentioned studies, the viscosity of the fluid was assumed to be constant. However, it is known that the fluid physical properties may change significantly with temperature changes. To accurately predict the flow behaviour, it is necessary to take into account this variation of viscosity with temperature. Recently, many researchers investigated the effects of variable properties for fluid viscosity and thermal conductivity on flow and heat transfer over a continuously moving surface. Seddeek  investigated the effect of variable viscosity on hydromagnetic flow past a continuously moving porous boundary. Seddeek  also studied the effect of radiation and variable viscosity on an MHD free convection flow past a semi-infinite flat plate within an aligned magnetic field in the case of unsteady flow. Dandapat et al. analyzed the effects of variable viscosity, variable thermal conducting, and thermocapillarity on the flow and heat transfer in a laminar liquid film on a horizontal stretching sheet. Mukhopadhyay  presented solutions for unsteady boundary layer flow and heat transfer over a stretching surface with variable fluid viscosity and thermal diffusivity in presence of wall suction. The study of magnetohydrodynamic flow of an electrically conducting fluid is of considerable interest in modern metallurgical and great interest in the study of magnetohydrodynamic flow and heat transfer in any medium due to the effect of magnetic field on the boundary layer flow control and on the performance of many systems using electrically conducting fluids. Many industrial processes involve the cooling of continuous strips or filaments by drawing them through a quiescent fluid. During this process, these strips are sometimes stretched. In these cases, the properties of the final product depend to a great extent on the rate of cooling. By drawing these strips in an electrically conducting fluid subjected to magnetic field, the rate of cooling can be controlled and the final product of required characteristics can be obtained. Another important application of hydromagnetics to metallurgy lies in the purification of molten metals from nonmetallic inclusion by the application of magnetic field. When the conducting fluid is an ionized gas and the strength of the applied magnetic field is large, the normal conductivity of the magnetic field is reduced to the free spiraling of electrons and ions about the magnetic lines force before suffering collisions and a current is induced in a normal direction to both electric and magnetic field. This phenomenon is called Hall effect. When the medium is a rare field or if a strong magnetic field is present, the effect of Hall current cannot be neglected. The study of MHD viscous flows with Hall current has important applications in problems of Hall accelerators as well as flight magnetohydrodynamics. Mahmoud  investigated the influence of radiation and temperature-dependent viscosity on the problem of unsteady MHD flow and heat transfer of an electrically conducting fluid past an infinite vertical porous plate taking into account the effect of viscous dissipation. Tsai et al. examined the simultaneous effects of variable viscosity, variable thermal conductivity, and Ohmic heating on the fluid flow and heat transfer past a continuously moving porous surface under the presence of magnetic field. Abo-Eldahab and Abd El-Aziz  presented an analysis for the effects of viscous dissipation and Joule heating on the flow of an electrically conducting and viscous incompressible fluid past a semi-infinite plate in the presence of a strong transverse magnetic field and heat generation/absorption with Hall and ion-slip effects. Abo-Eldahab et al. and Salem and Abd El-Aziz  dealt with the effect of Hall current on a steady laminar hydromagnetic boundary layer flow of an electrically conducting and heat generating/absorbing fluid along a stretching sheet. Pal and Mondal  investigated the effect of temperature-dependent viscosity on nonDarcy MHD mixed convective heat transfer past a porous medium by taking into account Ohmic dissipation and nonuniform heat source/sink. Abd El-Aziz  investigated the effect of Hall currents on the flow and heat transfer of an electrically conducting fluid over an unsteady stretching surface in the presence of a strong magnet. The present paper deals with variable viscosity on magnetohydrodynamic fluid and heat transfer over an unsteady stretching surface with Hall effect. 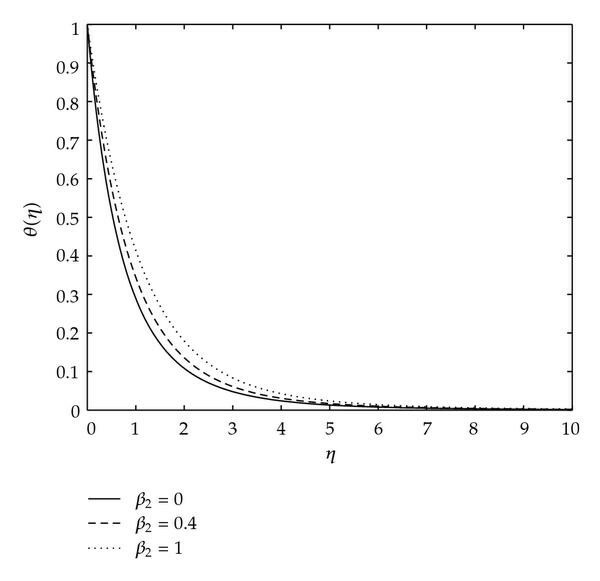 Fluid viscosity is assumed to vary as an exponential function of temperature while the fluid thermal diffusivity is assumed to vary as a linear function of temperature. Using appropriate similarity transformation, the unsteady Navier-Stokes equations along with the energy equation are reduced to a set of coupled ordinary differential equations. These equations are then numerically solved by successive linearization method. The effects of different parameters on velocity and temperature fields are investigated and analyzed with the help of their graphical representations along with the energy. where and are the velocity components along the - and -axis, respectively, is the velocity component in the direction, is the fluid density, is the coefficient of thermal expansion, is the kinematic viscosity, is the acceleration due to gravity, is the specific heat at constant pressure, and is the temperature-dependent thermal conductivity. where and are positive constants with dimension reciprocal time. Here, is the initial stretching rate, whereas the effective stretching rate is increasing with time. In the context of polymer extrusion, the material properties and in particular the elasticity of the extruded sheet vary with time even though the sheet is being pulled by a constant force. With unsteady stretching, however, becomes the representative time scale of the resulting unsteady boundary layer problem. where is a (positive or negative; heating or cooling) reference temperature. where is the physical stream function which automatically assures mass conservation (2.1) and is constant. The governing nondimensional equations (2.9)–(2.11) along with the boundary conditions (2.12)-(2.13) are solved using a numerical perturbation method referred to as the method of successive linearisation. where the coefficient parameters , , ( ), , , and are defined in the appendix. In this section, we give the SLM results for the six main parameters affecting the flow. We remark that all the SLM results presented in this paper were obtained using collocation points. For validation, the SLM results were compared to those by Matlab routine and excellent agreement between the results is obtained giving the much needed confidence in using the successive linearization method. Tables 1–3 give a comparison of the SLM results for and at different orders of approximation against the In Table 1, we observe that full convergence of the SLM is achieved by as early as the third order, substantiating the claim that SLM is a very powerful technique. We observe in this table that the variable viscosity parameter significantly affects the skin friction The skin friction increases as increases. We observe also in this table that the local Nusselt number decreases as the fluid variable viscosity parameter increases. The lower part of Table 1 depicts the effects of variable diffusivity parameter on the local skin friction and the local Nusselt number It can be observed that does not have significant effect on the skin friction but very significant effects on the local Nusselt number. As increases, the skin friction slightly decreases but the local Nusselt number is greatly reduced. Comparison between the present successive linearisation method (SLM) results and the bvp4c numerical results for and for various values of and when . 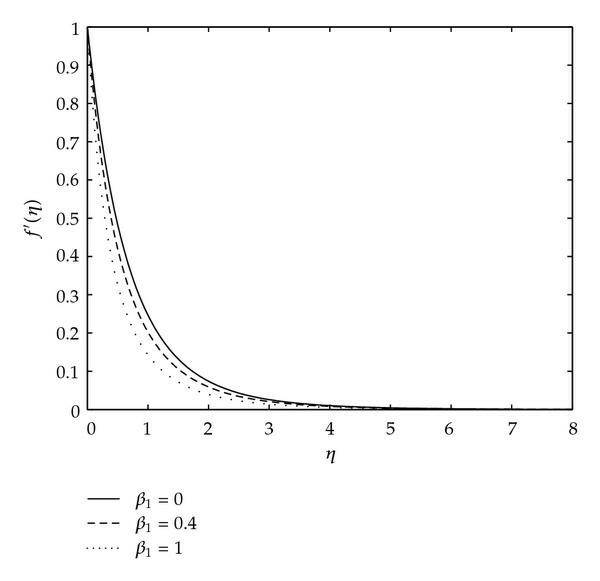 From Table 2 (upper part), it is observed that the Hartmann number tends to greatly increase the local skin friction at the unsteady stretching surface. This is because the increase in the magnetic strength leads to a thinner boundary layer, thereby causing an increase in the velocity gradient at the wall. We also observe that the local Nusselt number decreases as the values of increase. We observe in the lower part of Table 2 that the local skin friction is reduced as the Hall parameter increases, but the Nusselt number increases as increases. Table 3 depicts the effects of the unsteadiness parameter , (upper part) the Prandtl number (lower part) on the local skin friction, and the local Nusselt number. We observe that both of these flow properties are greatly affected by the unsteadiness parameter. They both increase as the values of increase. We also observe in this table that the Prandtl number has little effects on the skin friction but significant effects on the local Nusselt number. The local skin friction slightly increases as the values of the Prandtl number increase, while the Nusselt number is greatly increased as increases. Figures 1–12 have been plotted to clearly depict the influence of various physical parameters on the velocity and temperature distributions. 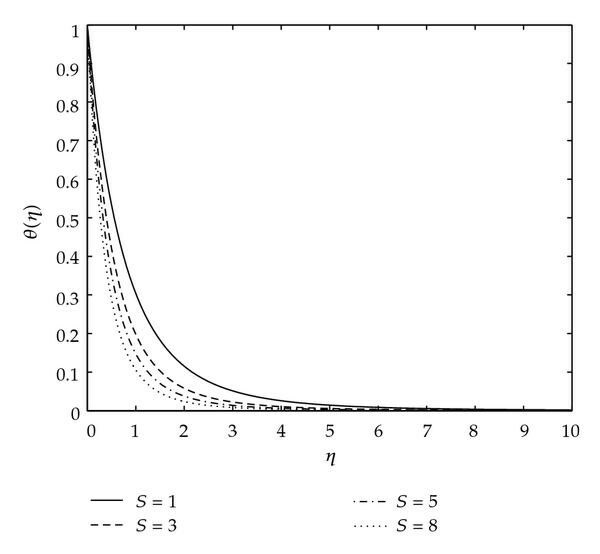 In Figure 1, we have the effects of varying the variable viscosity parameter on the axial velocity. It is clearly seen that as increases the boundary layer thickness decreases and the velocity distributions become shallow. Physically, this is because a given larger fluid implies higher temperature difference between the surface and the ambient fluid. The variation axial velocity distributions with increasing values of with , , , , and . 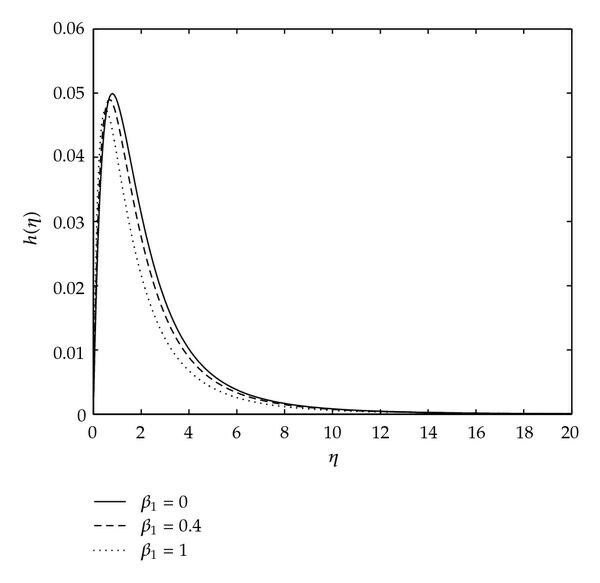 The effects of the unsteadiness parameter on the axial velocity are presented in Figure 2. 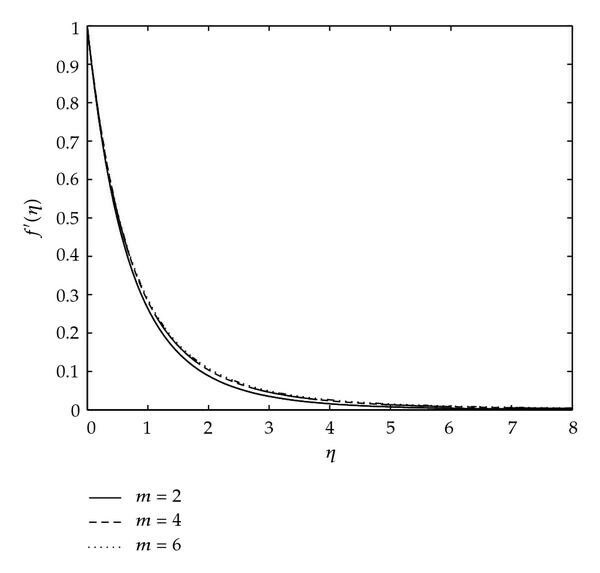 It can be seen in this figure that when values are increased, the boundary layer thickness is reduced and this inhibits the development of transition of laminar to turbulent flow. 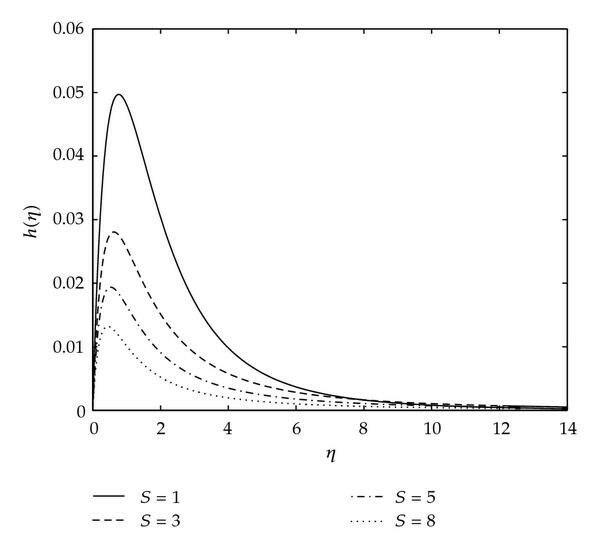 The effect of the magnetic strength parameter on the axial velocity is shown in Figure 3. It is noticed that an increase in the magnetic parameter leads to a decrease in the velocity. This is due to the fact that the application of the transverse magnetic field to an electrically conducting fluid gives rise to a resistive type of force known as the Lorentz force. This force has a tendency to slow the motion of the fluid in the axial direction. Figure 5 shows the effect of the variable viscosity parameter on the transverse velocity distribution As shown, the velocity is decreasing with increasing the values of In addition, the curves show that for a particular value of the transverse velocity increases rapidly to a peak value near the wall and then decays to the relevant free stream velocity (zero). 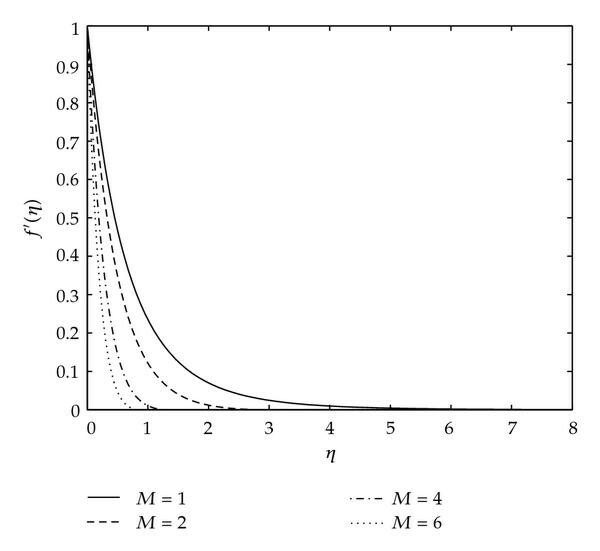 The effect of the unsteadiness parameter on the transverse velocity is presented in Figure 6. From this figure, it is seen that the effect of increasing the unsteadiness parameter is to decrease the transverse velocity greatly near the plate. 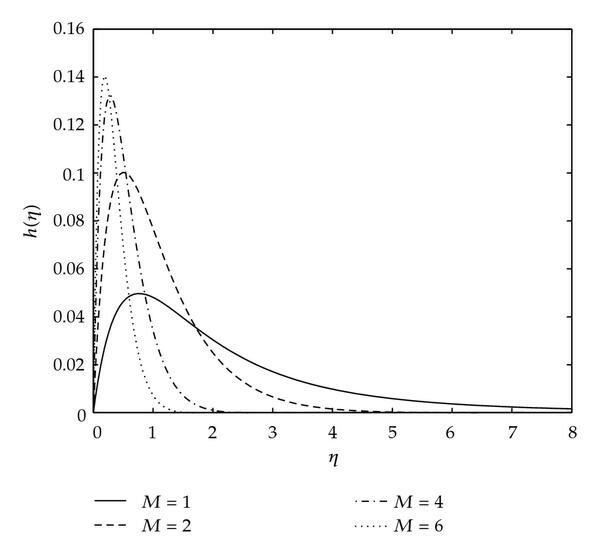 Figure 7 depicts the effects of the magnetic strength on the transverse velocity. We observe that close to the sheet surface an increase in the values of leads to an increase in the values of the transverse velocity with shifting the maximum values toward the plate while for most of the parts of the boundary layer at the fixed position, the transverse velocity decreases along with decreases in the boundary layer thickness as the magnetic field increases. Figure 8 is obtained by fixing the values of all the parameters and by allowing the Hall parameter to vary. Increasing the values of from 0 to 1.5 causes the transverse flow in the -direction to increase. However, for values of greater than 1.5, the transverse flow decreases as these values increase as can be clearly seen on Figure 8. This is due to the fact that for larger values of the term is very small, and hence the resistive effect of the magnetic field is diminished. 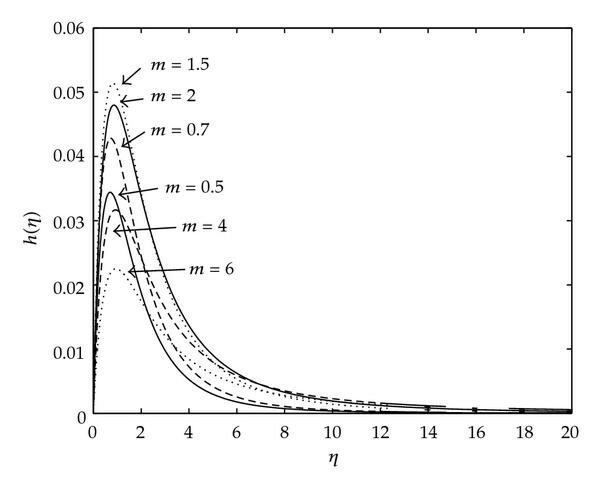 Figure 12 presents typical profiles for the fluid temperature for different values of Hartmann number Increases in the values of have a tendency to slow the motion of the fluid and make it warmer as it moves along the unsteady stretching sheet causing to increase as shown in this figure. The problem of unsteady magnetohydrodynamic flow and heat transfer of a viscous, incompressible, and electrically conducting fluid past a semi-infinite stretching sheet was investigated. The governing continuum equations that comprised the balance laws of mass, linear momentum, and energy were modified to include the Hartmann and Hall effects of magnetohydrodynamics, and variable viscosity of the fluid was solved numerically using the successive linearization method together with the Chebyshev collocation method. Graphical results for the velocity and temperature were presented and discussed for various physical parametric values. The effects of the main physical parameters of the problem on the skin friction and the local Nusselt number were shown in Tabular form. It was found that the skin coefficient is increased as the variable viscosity parameter, Hartmann number, unsteadiness parameter, or the Prandtl number is increased. It was found, however, to decrease as the thermal diffusivity parameter or the Hall parameter increases. 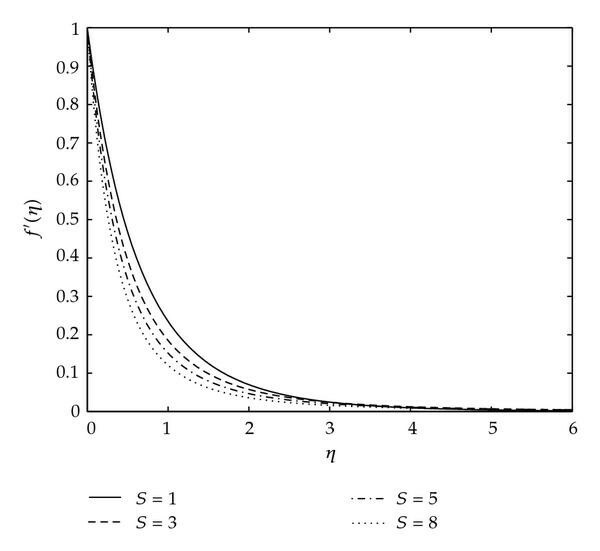 The local Nusselt number was found to be decreasing as the values of the variable viscosity parameter, thermal diffusivity parameter, or Hartmann number increase and to be increasing with increasing the values of the Hall parameter, unsteadiness parameter, or the Prandtl number. It is hoped that, with the help of our present model, the physics of flow over stretching sheet may be utilized as the basis of many scientific and engineering applications and experimental work. In the above definitions, , , and ( ) are diagonal matrices of size .